Time to get ready Super Heroes! A new chapter has been released today for Disney Interactive’s Disney Infinity: Marvel Super Heroes (2.0 Edition), which is on the PS4, PS3, Xbox One, Wii U, plus you can also download it for free on your iPad, iPhone (coming soon), Windows 8 device and PC. 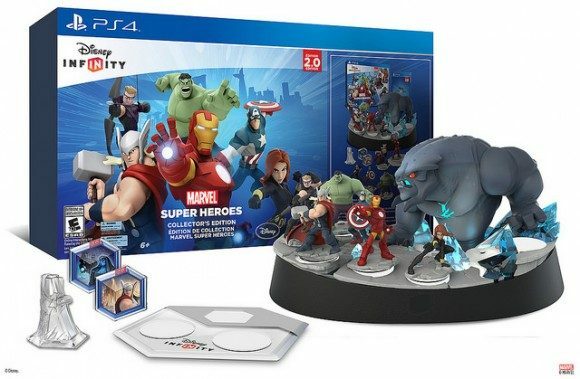 Back in July, the Executive Producer of Disney Interactive, John Vignocchi announced the Collector’s Edition, mentioning that it will include the Starter Pack, all of the launch Avengers character figures, and an exclusive light-up Frost Beast display, plus with the Collector’s Edition you will be able to get Hulk at launch. The Collector’s Edition is exclusive only to PS4, and PS3. The starter pack in the Collector’s edition comes with the Avengers characters, but you can also pick up Marvel’s Guardians of the the Galaxy and Spider-Man Play Sets, plus the characters that from those universes are made available separately. Take on new super hero story-driven adventures in the Marvel universe with these 3 Play Sets. Players, be expecting some new character features and combat systems, along with a much bigger universe compared to the first installment of Disney Infinity. 1. Night Castle – Under the light of the full moon, an evil castle appears, bringing with it a terrible curse. Classic action-platforming! 2. The Game Room – Want to play a game? Find 4 weights and place them on the buttons to open the door in the cabinet to access the game inside. 3. Pastry Panic!! – Eat all of the pastries. What could go wrong? It’s a collection game gone mad! 4. Remote Bowling HD – Can you guide the ball through this treacherous maze? The clock is ticking! Classic arcade action! 5. FIGHT FIGHTERS – Battle a friend one-on-one in this classic 2D fight to the finish! Don’t let Rumble McSkirmish down! 6. I. Am. Groot. – Sakaaran soldiers are attacking Groot’s home world Planet X. Help! Created by Mighty Gitis. 7. Mysterious Worlds – Battle through Mysterio´s illusions to uncover his secret weapon. Created by TurnerBros. 8. The Dark Aster – Relive the finale of Guardians of the Galaxy. Start off on Planet Xandar and travel to the Dark Aster. Created by Pirate Steven. 9. Tink’s Pixie Hollow – Faith, Trust, and Pixie Dust! Play a game at the Coliseum and go inside Tinker Bell’s house. Created by Vault of villains. 10. Jurassic Adventure – A short Jurassic course scattered with traps awaits you. Open chests, defeat enemies along the way, and climb up a terrible predator. Good luck! Created by dsmmat. Those interested in the Disney Toy Box Starter Pack and 2.0 Disney characters will be released on November 4th. Be prepared to blasting your way through the game, with your new 2.0 Disney characters! You can find out more information about Disney Infinity on their official site. You can keep up with the game by liking them on Facebook and follow them on Twitter.